I could start this off with some reference to the now ubiquitous quote from Fred Armisen and Carrie Brownstein's series, Portlandia, about the city's fascination with placing birds on things, but then I'd actually have to type the phrase and that would make me cringe. So to avoid that unpleasantness, I'll try something else. Fusion is a term that, when I hear it used in conjunction with food, makes me want to scream, "Run away!" Much like the recent fascination with molecular gastronomy, it conjures images of a three-ring circus with people in chef's coats jumping through hoops, juggling bowling pins and spinning plates to the tune of Khachaturian's "Sabre Dance." In other words, making the acts of cooking and eating more about performance and technical prowess than doing justice to the flavors found in the ingredients themselves. Dungeness crab with winter melon. So when I heard Aviary, a new restaurant on Alberta Avenue, described as "an innovative East-meets-West blend," I immediately went into "uh-oh" mode. Another warning bell sounded when I read that it featured not one but three chef-owners, Sarah Pliner, Jasper Shen and Katherine (Kat) Whitehead. Huh? I thought there was a "one ego per kitchen" rule. Was this a train wreck in the making? Than last week a bunch of the city's restaurants got together for a "Dine Out for Japan Relief" benefit. Since Dave had a friend who was gaga about the place and he was a little embarrassed to admit that his foodie blogger wife hadn't been there yet, we decided to rectify the situation and head over despite my nervousness. After all, it was for charity, right? 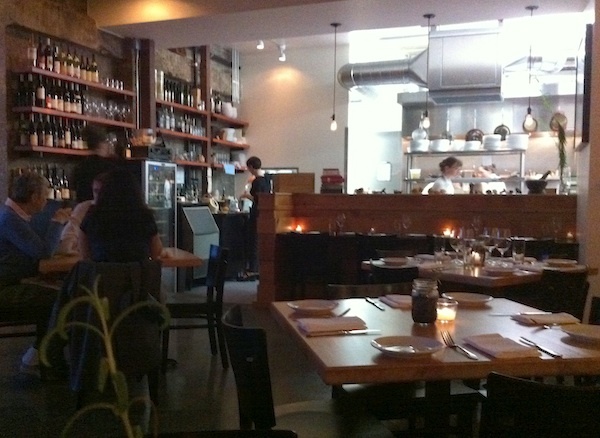 The lighting at the table was too dark for decent photos, so forgive the lack of visuals, but the flavors and combinations we found on our plates were vivid and brilliantly creative. Organized into three categories, small plates, seasonal and larger plates, the idea is to mix and match them, ideally sharing plates among the diners at the table. We opted to be a little more traditional and ordered a few to share, then we each ordered our own entrées with the usual "bites" privilege in force. 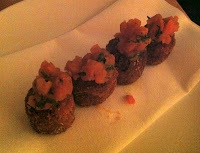 Oxtail croquettes with tomato jam. The Dungeness crab with winter melon and mentaiko was a personal revelation, since I'd never tasted crab and sweet green melon together. (Yet another idea I'm going to steal for future use.) When the oxtail croquettes came, they seemed a little too darling at first, but the one-bite bits exploded with a powerful meatiness in my mouth and I raised the white flag as any misgivings I'd brought with me vanished. The Asian pear and celery root salad with arugula, watermelon radish and candied cumin was genius, the sweetness and crunch of the components held together by the lacing of cumin. My braised beef cheek with celery root, blood orange and gingko nuts was piled on a smear of creamy fennel purée, and I'm pretty sure that even Mario's dad Armandino wouldn't have turned up his salumi-loving nose at this dish with its fall-apart tender meat spiked with the tartness of the blood orange sections. Dave was brave and ordered the crispy pig ear that was described as being done paella-style and, indeed, it did come in a small paella pan, but you can forget any Spanish inflections after that. The chunks of porky ear cracklings were essentially set on top of a creamy coconut milk rice that had been topped with a mix of braised greens, Chinese sausage and avocado. The flavor was definitely Asian-inspired, but again a combination that I'd never experienced (the "bites" rule, remember?). 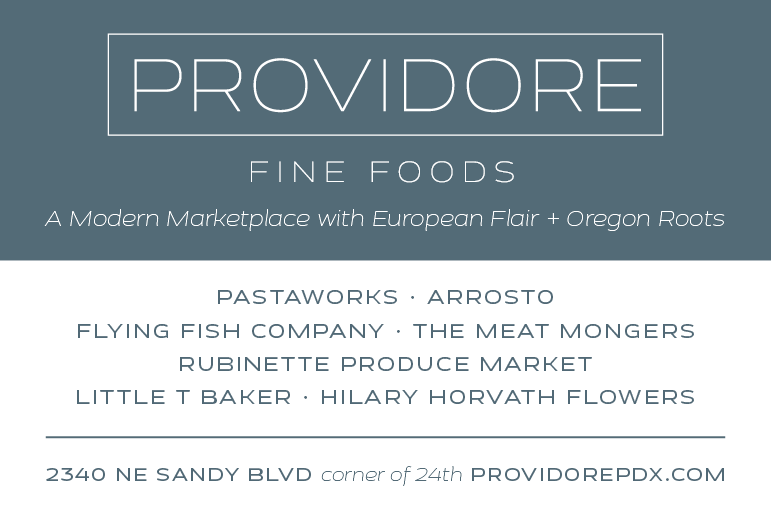 Details: Aviary, 1733 NE Alberta St. 503-287-2400. Yes indeed that was a fun trip to Aviary. I think you captured the experience very well. 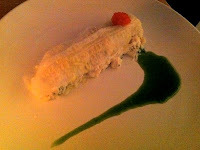 I found the food very interesting, and very intense. A good stop for foodies for sure.